Britain has begun testing its own driverless cars, as the government has agreed to a “light touch, non-regulatory approach” to testing the vehicles on public roads, following a six-month review of the country’s technical adaptability to driverless tech. The UK government has channeled £19 million ($29 million) into four pilot programs across the country, it was revealed Wednesday. A government review also pointed out that by 2030, Britain expects to become a leader in the field. Not only that – by then you’ll also be able to sit back, surf the net and completely disregard the fact that you’re on a perilous journey with hundreds of other automated vehicles around you. However, don’t get your hopes up just yet if you live in the UK, thinking it’s going to be futuristic luxury vehicles there anytime soon. UK roads will first get a few bulky, non-personalized offerings, like shuttle buses. They won’t be available to the public and will always have a driver behind the wheel as the tests progress. They will be launched mostly in pedestrian areas as well. The two types of vehicle will be first introduced in London’s Greenwich area and the city of Milton Keynes, as well as Bristol and Coventry. A legal review of UK laws was conducted by the Department for Transport (DfT) and a 'code of practice' was introduced specifically for the tests, which the government believes is more “flexible" than in the US, which so far only legalized driverless cars in four states. This is not a final legal review. 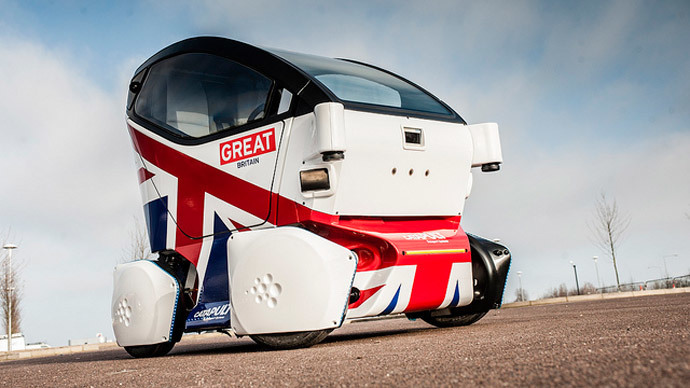 The UK is to introduce more comprehensive driverless car laws by 2017, detailing more precisely things like liability. In the meantime, the current code of practice will be published in spring. If all goes well, the vehicles will appear on British roads in a wider sense by 2018, when the four pilot projects have finished running. The testing period should serve as encouragement for automakers to invest in the technology. So hopes Transport Minister Claire Perry. "I want Britain to be at the forefront of this exciting new development, to embrace a technology that could transform our roads and open up a brand new route for global investment," she revealed in a statement. The industry is projected to grow vastly and reach 900 billion pounds ($1.37 billion) over the next 10 years. Although Google is considered a pioneer in the technology, other makers have been steadily entering the market. The British public isn’t terribly enthusiastic about the technology survey found. About 40 percent of the people polled by uSwitch.com said they didn’t wish to risk being driven around by a driverless car. A minority of 16 percent said they were “horrified” at the prospect. And they are not entirely unreasonable if one considers the view that driverless cars could be hacked, just like any box with wires for brains. That warning was floated by US Senator Ed Markey (D-Massachusetts), who is imploring car markers everywhere to implement mandatory safeguards with regard to privacy protection. Many have shared this view. Otherwise, the driverless car world is bustling with both innovation and corporate intrigue: more and more companies from wholly different industries are becoming (or are rumored to be becoming) sworn rivals: Uber and Google were the focus of controversial rumors when the former announced that its opening up its own research center into driverless technology, while the latter was supposedly pulling its investments from Uber and developing its own taxi service. The second rumor was never backed up. READ MORE: Google to drive wedge into Uber’s car ambitions? Apple also had people guessing recently when a Dodge minivan with gadgets mounted atop it was seen driving around San Francisco, although its own foray into the driverless market is for now just speculation. Google’s own offering should hit American roads sometime in 2015.